Please place your order at least 3 days in advance with daily cut-off time at 2p.m.. Delivery service is available at a charge per location, from Monday to Friday (between 11:30a.m. to 1:30p.m. and 3:00p.m. to 5:30p.m.) and Saturday (between 11:30a.m. to 1:30p.m. ), except Sunday & Public Holidays. To dignify your parties and events, The Grand Buffet has got you covered with its The Grand Catering Service featuring array of diversified delicacies including South East, Japanese and International. Please place your order at least one week prior to your preferred collection date. Complimentary delivery service is included between 11:00am – 5:30pm (arrival time). Additional $200 will be charged if deliver at 5:30pm – 8:00pm. Enjoy an exclusive discount when you purchase "The Grand Tea Time" voucher (except festive days) online. The Grand Tea Time is available every Sunday (15:00 - 17:30). A perfect gift for any occasions! Gift vouchers are available in denominations of HKD 500 and HKD 1,000. For further information about the gift vouchers, please contact us at +852 2506 0666/ 2506 0888 or email us at enquiry@grandbuffet.hk. 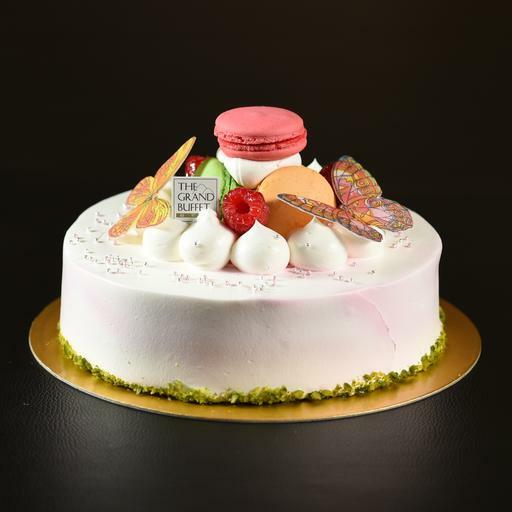 A chiffon cake covered by velvety white chocolate cream, topped with colorful decoration. It's best to consume the cake on the day of collection / delivery. Photo is for reference only. *Please note that Cake Order for dine-in is subject to 10% service charge and the service charge will be charged at The Grand Buffet.